This is the third part of a three part essay. In case you missed them, here is part one; here is part two. A few months after breaking things off with Bartok, Stefi finally met her long-time admirer in July 1908. Immediately Schoeck began to write for her. First came a tiny Albumblatt, then a full-length Violin Sonata, and then an actual Violin Concerto. All three were dedicated to Stefi. He continued in his attempts to woo her throughout 1908, later claiming they wrote passionate love letters to each other. If they did - and historians are skeptical on the point - they were later burned by his wife. Adding weight to that skepticism is the fact that Schoeck complained to others that all the physical contact he had been able to wring out of Stefi was a chaste kiss, and that Stefi was his only female friend that had not at some point made a pass at him. Sometime around 1910, Stefi Geyer became engaged to Viennese lawyer Erwin Jung. Predictably, Schoeck referred to him as a “Viennese ponce” - or a person who fakes having class or culture. During her engagement, she invited Shoeck to come to visit her and her family in Budapest. He accepted the invitation, went to Budapest, wrote an unconvincing postcard to his friends that he had gotten over her, came home, and then promptly began writing a violin concerto for her. While he was writing the piece, he began rooming with a Russian medical student named Bertha Liebert. She soon became pregnant, but the baby died the same day it was born. He nonetheless continued to sleep with Bertha while hoping against hope that he could seduce Stefi. The violin concerto that Schoeck wrote for Stefi. To Schoeck’s dismay, Stefi married in 1911 and relocated to Vienna, where she took the name Stefi Geyer-Jung and taught. Unfortunately her marriage with Jung was not a happy one, and he eventually began drinking heavily. Throughout this turbulent time Stefi continued with her career, touring throughout Europe and even playing a concerto in Budapest that her old teacher Jeno Hubay had written for her. During the late teens, perhaps spurred in part by the war and her unhappy marriage, Stefi seems to have reconsidered the direction of her identity as an artist. 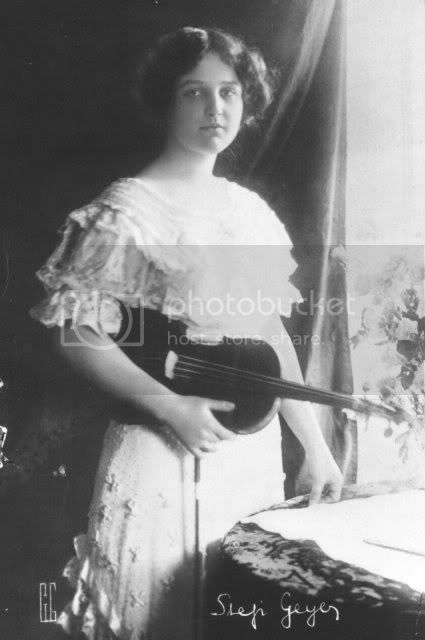 She began studying with violinist Adolf Busch in Budapest, learning new repertoire and new styles of playing, and in the process switching the emphasis of her repertoire from virtuosic Romantic pieces to more restrained Classical ones. Her pace of touring did not diminish throughout the twenties. In fact, she gave more than a hundred concerts in Scandinavia in the 1922-23 season alone. In 1924 she traveled to America, but reviews of her performances there have not surfaced. She performed many concertos with all of the major Swiss orchestras, and even performed the violin concerto Schoeck had written for her, with Schoeck at the podium. During the thirties she recorded a good deal, and today we have records of her interpretations of Bach, Beethoven, Mozart, Haydn, and even Schoeck, although they are difficult to find on disc. Although she and Bartok had parted fifteen years or so ago under less than amicable circumstances, they apparently somehow reconciled in the teens or twenties. In fact, by 1928, Bartok, Stefi, and her husband were all writing friendly letters to one another. Schulthess and Stefi often played his compositions, and in 1929 Stefi performed in a recital that consisted of all Bartok’s music. In 1940, she even helped Bartok and his second wife Ditta emigrate to America to escape the turmoil enveloping Europe, and she would often introduce her students to this extraordinary man and composer. Stefi Geyer died in December of 1956 in Zurich. Somehow after her death her friend and fellow musician Paul Sacher retrieved the manuscript and the letters from Bartok that she had kept locked away for so many years. Sacher was the conductor at the world premiere of the piece in Switzerland in 1958, and in the spring of 1961 Isaac Stern gave its American premiere at Carnegie Hall. Although it is not heard as often as the Second Violin Concerto, it is still occasionally revived today. Stefi Geyer playing Dvorak's Slavonic Dance No 2 with her second husband, Walter Schulthess on the piano. All three chapters you have written are fascinating. I looked forward to each new one. Stefi must have been quite an incredible woman -- beautiful enough to attract men and not to lose their interest by her own substantial accomplishments. Her life was very different from that of Alma Mahler, who was also beautiful and talented, but lived mainly as a muse to various men. I'm so glad that you did so much research on this accomplished woman who has been overlooked. It reminds me of Rachel Barton Pine and Maud Powell. I really enjoyed your writing. Thank you, Pauline. Yes, she was a very interesting woman. I feel bad that more information about her as a person is not available. Perhaps somewhere in Europe there are more letters - photographs - essays - diary entries - newspaper articles - something that can tell us more. There must be. Eventually someone will get around to digging them out and sharing them!